The obits focus heavily on his role as Snape in the Potter films, but for me the late Alan Rickman will always be the touchstone for action movie villians. With deepest respect, I post again this Christmastime movie review. One of the great self-referential pop culture moments of recent years occurred on the TV show 30 Rock, when Jack Donaghy (Alec Baldwin) portentously intoned “When Alexander saw the breadth of his domain he wept for there were no more worlds to conquer….Hans Gruber”. My last Christmas film recommendation features the ultimate Yuletide villain. Unlike the Grinch, he is never redeemed. He would shoot Mr. Potter through the head in style, blow up Scut Farkis with gelignite, and hurl Heat Miser from an 80 story skyscraper. 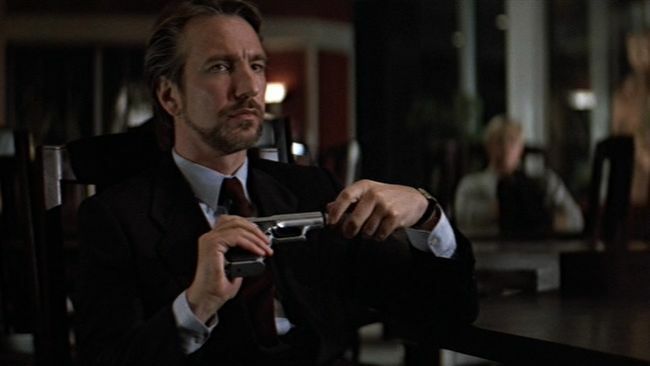 Ladies and gentleman, I give you the best of Christmas cinema baddies: Alan Rickman’s deliciously evil, funny, cultured, intelligent and violent Hans Gruber in this week’s film recommendation, 1988’s Die Hard. Truly, this is a Christmas movie for all members of your family who like watching things explode. The plot: Rough and ready New York cop John McLain (Bruce Willis) has come to sunny L.A. for Christmas to try to repair his rocky marriage to his wife Holly (Bonny Bedelia). Holly has taken a dream job at the Nakatomi corporation, returned to using her maiden name (ouch! ), and thrived as a corporate executive without John around. But before they can get back to serious bickering, John and Holly have to deal with an international team of super-terrorists (think of them as like the EU, but competent) who take over the Nakatomi building. John has his wisecracks, his courage and lots of guns, but the bad guys are more numerous and have cooler accents, especially their Ã¼ber-planner and leader Hans (Rickman). This is a rock ’em sock ’em action film leavened with many pricelessly funny lines, most of them voiced by Willis or Rickman. The plot has many surprising twists and turns as Hans’ plan unfolds, McLain throws spanners into the works, and then Hans adapts, contingency by carefully planned contingency. Not much in the way of traditional holiday themes, but there are some gifts and Santa hats and pine trees and such around, so there it is, your final Christmas film recommendation. Merry Christmas to all you orphans of a bankrupt culture.